Parade of Homes, St. George 2014 – 2 Free Tickets!! Are you planning on going to the St. George Area Parade of Homes ? “Like” this post and our page on Facebook and be entered to WIN 2 Tickets to St. George Parade of Homes. Comment what you like about your house and double your chances! The winner will be picked at random and will be announced this Friday, February 14, 2014 at 10:00am when the parade begins. A chance to win two free tickets: like our post and page on Facebook. The St. George Area Parade of Homes is presented by the Southern Utah Home Builders Association (SUHBA). SUHBA is a trade association representing building industry businesses throughout Washington, Kane and San Juan Counties of Southern Utah. Our members play a vital role in the construction industry. Our mission is to build communities. Our tools are education, communication, participation and advocacy. Homes are open daily from 10 am to 7 pm throughout Washington County, Utah (closes at 5 pm on February 23rd). Plan to attend and see why the St. George Area Parade of Homes is one of the most popular Parades in the country – over 28,600 people attended last year! For more information, contact the Southern Utah Home Builders Association at 435-674-1400. Best Western does not endorse, sponsor, or administer this promotion. This promotion is in no way sponsored, endorsed or administered by, or associated with, Facebook. By participating, you hereby release and hold harmless Facebook from any and all liability associated with this promotion. This entry was posted in blog, BW Coral Hills, St. George Area, Things To Do and tagged parade of homes, parade of homes 2014, parade of homes st. george, parade of homes st. george 2014, parade of homes utah, parade of homes utah 2014 on February 10, 2014 by Alan Myers. 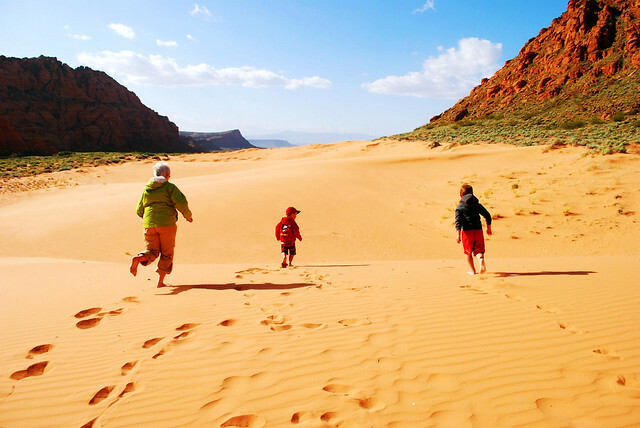 When you come to visit southern Utah, and specifically St. George, you will notice two predominant features on the surrounding hills. The first is a very large “D” lit up on the Black Hill and a “DIXIE” painted on the sugar loaf or the Red Hill. Obviously, the “D” stands for Dixie; but why? 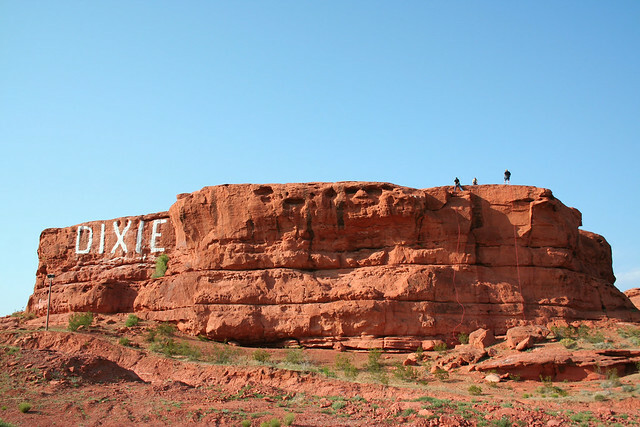 How does “Dixie” fit in to St. George? When the Mormon (Church of Jesus Christ of Latter-Day Saints) Pioneers left the United States to go out west and settled what is now Salt Lake City they the began to establish settlements about every fifty miles to the north, south, east and west. The reason it was every fifty miles is because that was about how long the signal on a telegraph wire would extend. This expansion of what was then called the Territory of Deseret is most notable when looking at a map and the settlements that extend north into Canada and as far south into Mexico. In fact it is interesting to note that the cities of Mesquite and Las Vegas, Nevada were created due to this expansion effort. Geographically there is a mountain range between St. George and Cedar City, Utah…fifty miles north. This is the reason for the drastic difference in weather between northern Utah, which has great snow skiing, and southern Utah which has great golf – year-round. The warmer weather alone still doesn’t account for the nickname “Dixie”. When the American Civil War broke out it became extremely expensive to find cotton and have it shipped to the western territories. Thought the Mormons did not actively participate in the Civil War fighting they claimed faithfulness to the Union and had strong antislavery sentiments. To find remedy to this lack of cotton several of the Mormon Saints were sent to establish the Cotton Mission. They were charged to grow cotton and other warm climate crops. Today one can still tour the Historic Cotton Mill which currently houses the Star Nursery Business. Some of those Saints were from the southern United States and had the special skills and knowledge in growing cotton. Other products that are known to come out of the area included Dixie Wine, silk and tobacco. Grapes grow well in the area and one will notice Mulberry trees that abound in the historic areas of Downtown St. George. The leaves from these trees was harvested to feed to the silk worms. So, for the warmer climate, the growing of cotton by some Southern Saints, the area became known as Dixie, and later Utah’s Dixie. This entry was posted in blog, St. George Area and tagged cotton mill st. george, cotton mill washington utah, cotton mission, dixie, dixie st. george, southern utahs dixie, What does "Dixie" have to do with Southern Utah? on January 6, 2014 by . Snow Records for St. George, Utah, 3rd highest on record. All over St. George there are scenes occurring which are not often seen. First, the more obvious, there is white stuff all over everything. After some research it was determined that indeed it was snow….and staying. This conclusion was reached due to the freezing air temperature, cars sliding on the road, children sledding down hillsides and a multiplicity of what looks to be snowmen and snow forts doting the city. Even ice cycles have appeared overnight. There can be a snowfall about once, maybe twice, a year and typically it is gone within hours or by the end of the next day. It certainly is a pretty site however when viewed from atop any of the area hillsides. Check this link for more information and stories regarding the snow from St. George News. Record snowfall of 8″ in December 2013 ties for third place. This entry was posted in blog, St. George Area and tagged 2013 st. george snow, snow, snow storm st. george 2103, st. george ut snow records on December 9, 2013 by .